Good performance, lots of features including DSP based EQ, crossover, delay, etc. Construction quality is acceptable, although flimsy. Not bad for such a budget amplifier. Single PCB construction with virtually no wiring whatsoever makes for very inexpensive (and error-free) production. 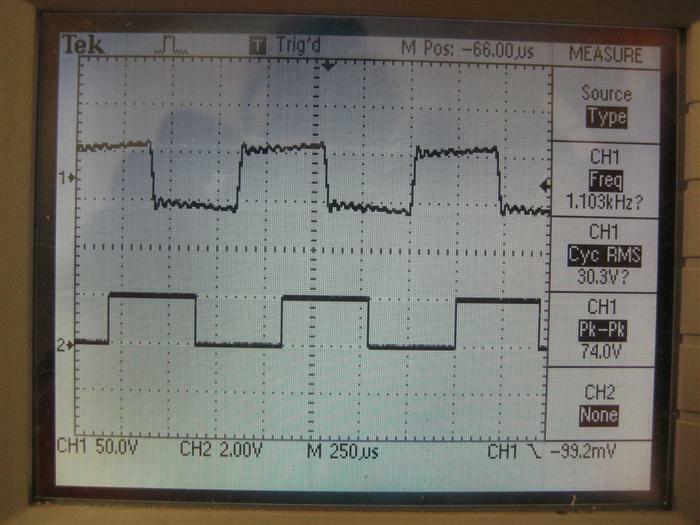 Amplifier was tested in "DSP Bypass" mode, but the audio signal still goes through A/D and D/A conversion. 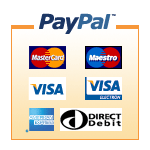 There is no hard bypass of the digital circuitry (which operates at 48kHz sampling rate). As such, there was considerable phase shift at higher frequencies, and a 10kHz square wave was turned completely sinusoidal by the digital conversion stage filtering out all the harmonics. This may impact the transient response of the amplifier. 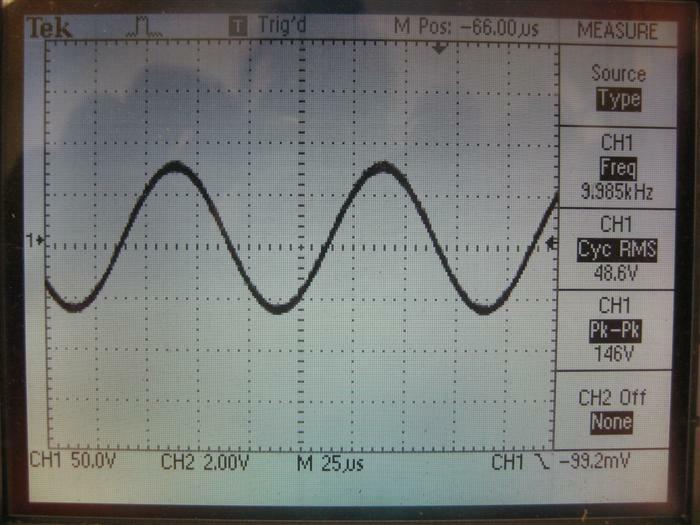 This is not a form of distortion per se, but an act of signal filtration. Threshold of clipping showed no nasties whatsoever, and the amp clips gracefully at all frequencies and load impedances. 2R testing posed tough for the amplifier, current limiting its output after a second or so. It lasted longer at 1kHz as opposed to 40Hz or 10kHz. Distortion was low even at full power, and hovered at about 0.08% at 3/4 power, but repeated sine testing at 4R (lid on) caused the amp to go into thermal limit. 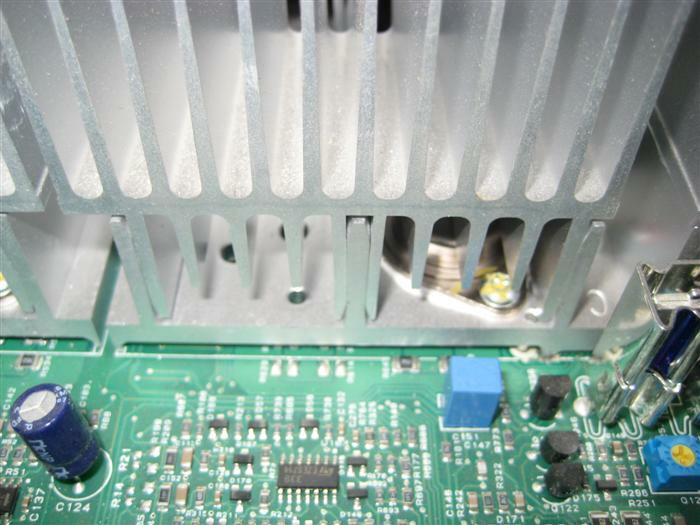 This is partly due to the push-on heatsinking arrangement where the output devices are bolted to a slab of aluminium, but the heatsink fins are push-fitted over the top. One of the eight heatsink blocks became very loose with a firm wiggle and may pose long-term reliability issues if used on the road. Thermal conductivity was sub-optimal through the push-fit joint as confirmed by the thermal images. (Allowances must be made for the differing IR emmissivity of polished metals, such as the heatsink fins, where temperature readings made by the thermal imaging camera can be 30 degrees or so lower than indicated. 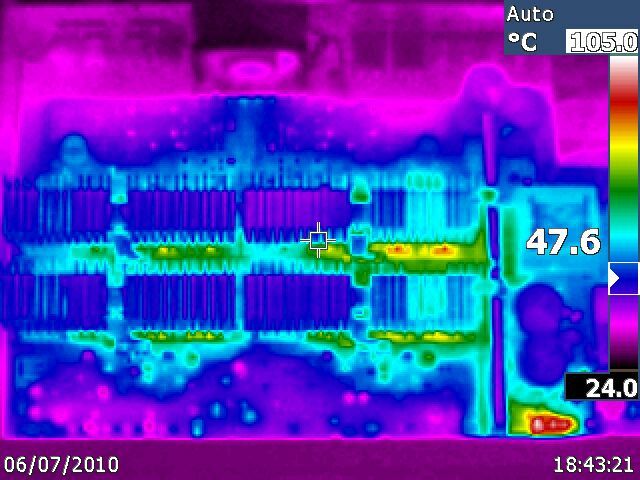 However, the emmissivity of the output devices and heatsinks in this case are virtually identical, so there is indeed a thermal gradient between them - see last image below). 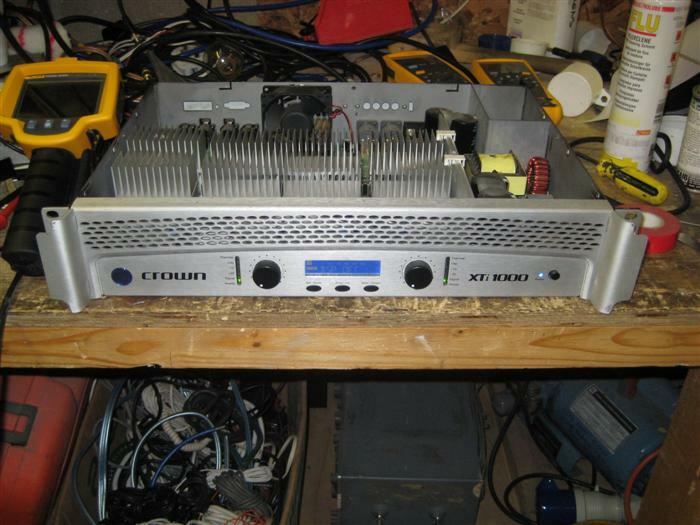 External shot of the amplifier. 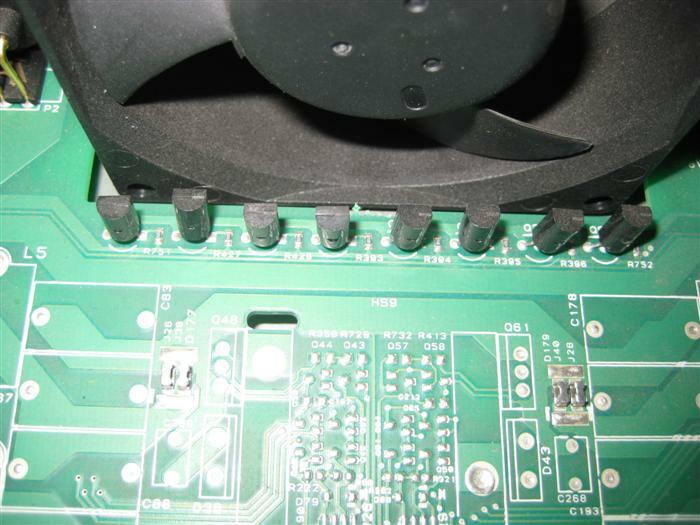 Closeup of one of the output device heatsinks showing push-fit system. 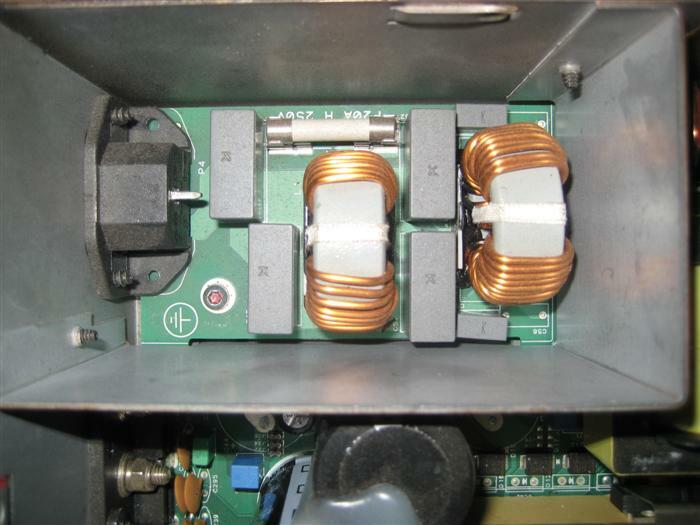 Fan speed control transistors. A very basic DAC, and an extremely eccentric arrangement. Input socket and common mode filter chokes. 40Hz 8R sine wave. Perfect. 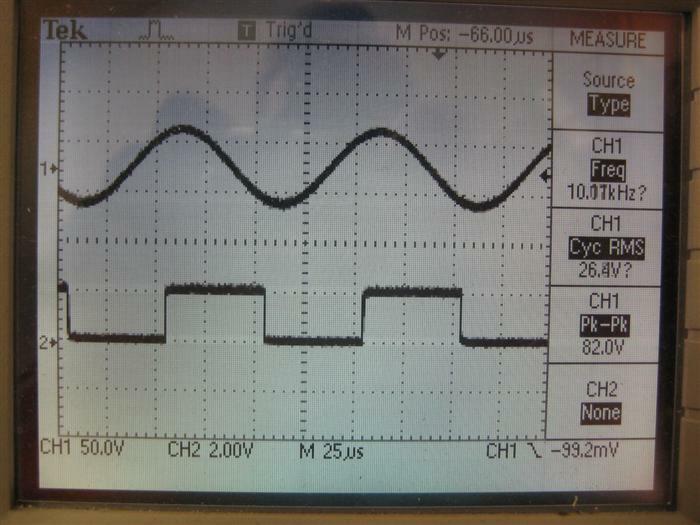 1.1kHz, 8R square wave, shows phase shift developing. 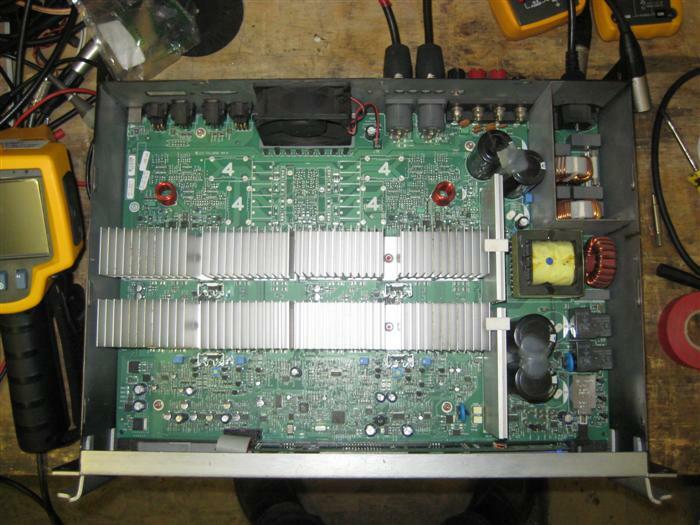 Bottom trace is amplifier input from the signal generator, top trace is amplifier output. ADC and DAC anti-alias filtering coupled with digital filtering is responsible for the ripples on the square wave, and the relatively long rise and fall times. 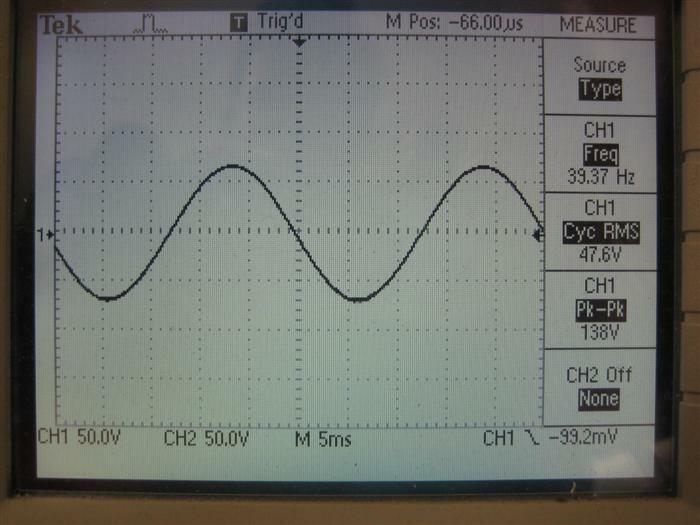 10kHz 8R square wave, shows phase shift. Bottom trace is amplifier input from the signal generator, top trace is amplifier output. The amplifier filters out all the harmonics necessary to make a square wave and turns the wave into an almost perfect sine wave. 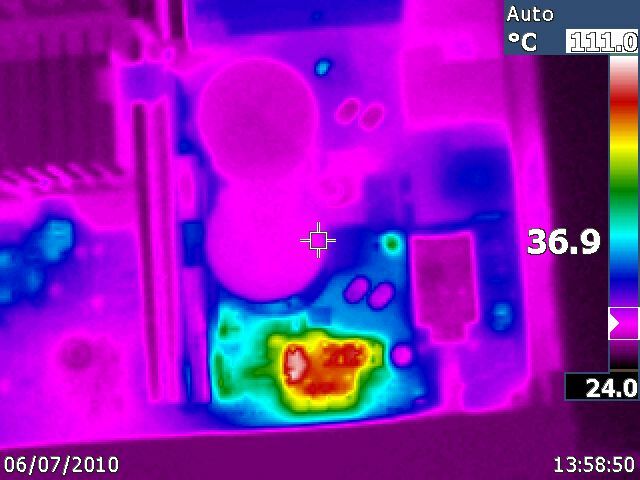 Thermal image of the power supply, no load, warmed up for 30 mins. A few components running above 100 degrees. 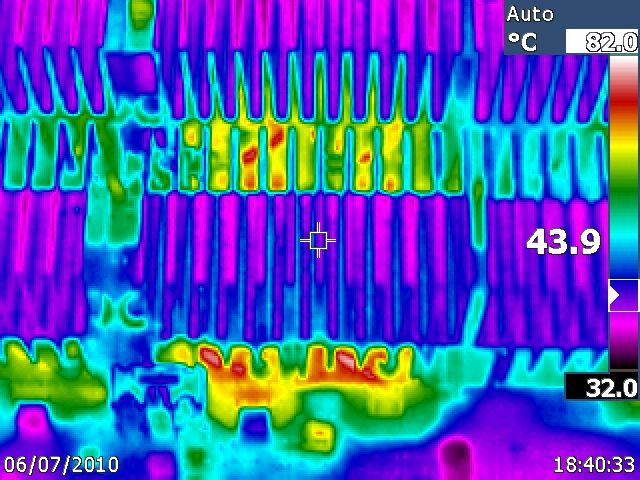 Thermal image - right hand side of amplifier section, no load, warmed up for 30 mins. Thermal image - left hand side of amplifier section, no load, warmed up for 30 mins. Thermal closeup of a SOP-8 IC on the amplifier PCB. It's possible to distinguish the location of the IC die. 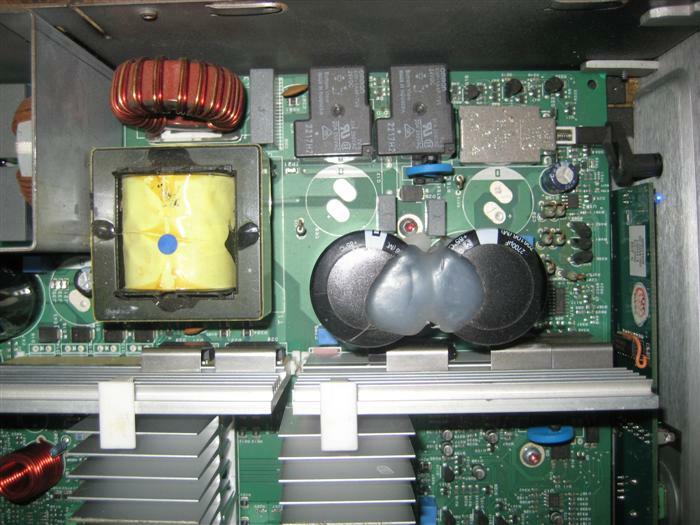 Also shows PCB copper used as a heatsink very effectively. 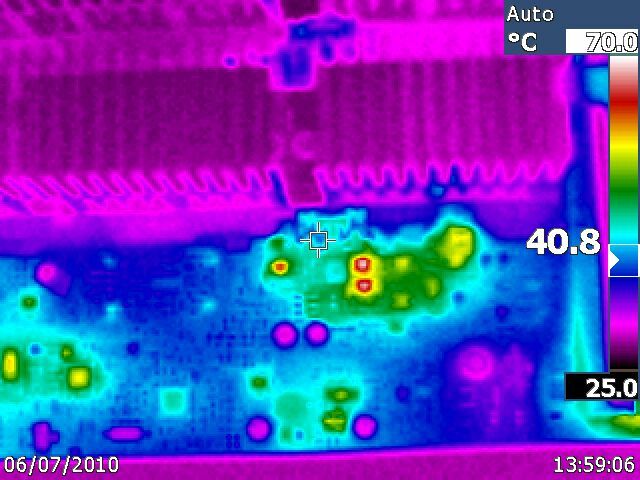 Thermal image of the amplifier running full power into 8R. 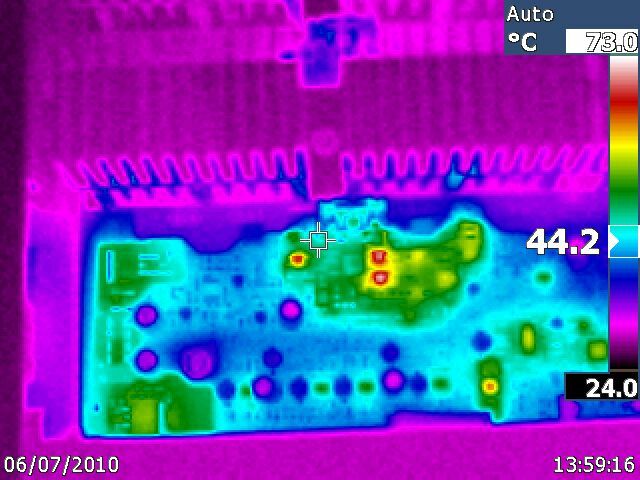 Thermal closeup of output devices running full power into 4R. 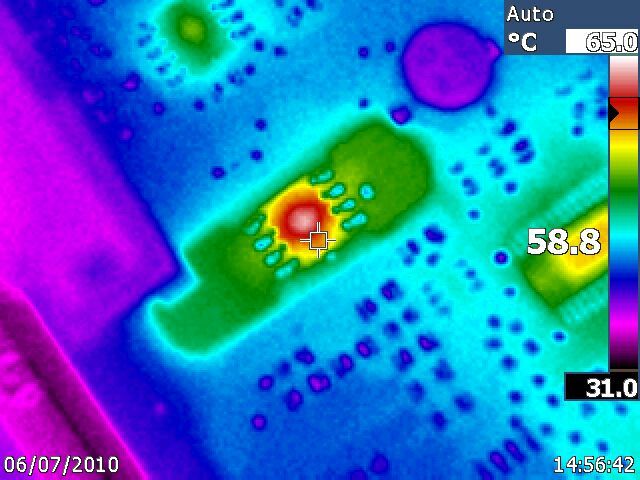 Note the transistors (red) are significantly hotter than the heatsinks themselves, partly due to poor thermal contact of the push-fit system.